It wasn’t the news the Angels were hoping for. 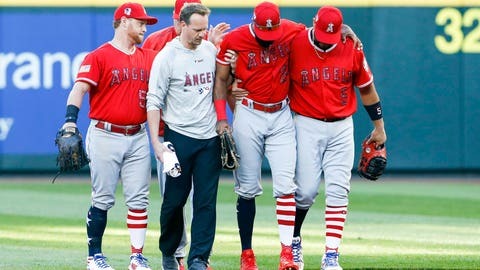 Outfielder Chris Young, who exited Tuesday’s game after slipping while making a play in right field, has been diagnosed with a grade 2 left hamstring strain. Young was initially placed on the 10-day DL with the opportunity to rejoin the team before the All-Star break starting July 14, but now that timeline will likely be significantly delayed. The 34-year-old was hitting just .168 in 54 games before sustaining the injury. With the extra roster spot, the Halos initially called up outfielder Jabari Blash from AAA Salt Lake, but with infielder Jefry Marte making his return from the DL, Blash was optioned back down. Currently, the only three outfielders listed on the Angels roster are Mike Trout, Justin Upton and Kole Calhoun, although infielder David Fletcher has also played outfield. The Angels currently have an MLB-leading 13 players on the disabled list.